Niskayuna is a town in Schenectady County, New York, United States. The population was 21,781 at the 2010 census. 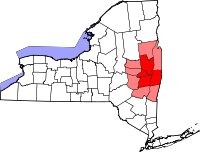 The town is located in the southeast part of the county, east of the city of Schenectady, and is the easternmost town in the county. The Town of Niskayuna was created on March 7, 1809, with an original population of 681. The name of town was derived from early patents to Dutch settlers: Nis-ti-go-wo-ne or Co-nis-tig-i-one, both derived from the Mohawk language. The 19th-century historians Howell and Munsell mistakenly identified Conistigione as an Indian tribe, but they were a band of Mohawk people known by the term for this location. The original meaning of the words translate roughly as "extensive corn flats", as the Mohawk for centuries cultivated maize fields in the fertile bottomlands along today's Mohawk River. They were the easternmost of the Five Nations of the Iroquois Confederacy. Among the Mohawk chiefs who lived in the area were Ron-warrigh-woh-go-wa (meaning in English the great fault finder or grumbler), Ka-na-da-rokh-go-wa (a great eater), Ro-ya-na (a chief), As-sa-ve-go (big knife), and A-voon-ta-go-wa (big tree). Of these, Ron-warrigh-woh-go-wa strongly objected to selling communal lands to the whites. He ensured that the Mohawk retained the rights of hunting and fishing on lands they deeded to the Dutch and other whites. He was reported to have said that "after the whites had taken possession of our lands, they will make Kaut-sore [literally spoon-food or soup] of our bodies." He generally aided the settlers during the mid-18th century against the Canadians in the French and Indian War, the North American front of the Seven Years' War. The first European settlers of the town were Dutch colonists who chose to locate outside the manor of Rensselaerwyck to avoid the oversight of the patroons and the trading government of New Netherland. Harmon Vedder obtained a patent for some land in 1664, soon after the founders in 1661 gained land in what developed as the village and city of Schenectady. The traders of Fort Orange retained their monopoly, forbidding the settlers in the Schenectady area from fur trading. They developed mostly as farmers. Among the early settlers were the ethnic Dutch Van Brookhoven, Claase, Clute, Consaul, Groot, Jansen, Krieger (Cregier), Pearse, Tymerson, Vedder, Van Vranken, and Vrooman families. Captain Martin Cregier, the first burgomaster of New Amsterdam, later settled in Niskayuna; he died in 1712. After World War II, the Knolls Atomic Power Laboratory was opened in 1946 in Niskayuna, under a contract between General Electric and the US government. In 1973, the General Electric Engineering Development Center moved from downtown Schenectady to River Road in Niskayuna. Today, it is the world headquarters of the four GE Global Research centers. Due to high-level scientific and technological jobs associated with these businesses, Niskayuna has a high level of education among its residents and a high per capita income of towns in the capital area. The following sites in the town are listed on the National Register of Historic Places: George Westinghouse Jones House, Niskayuna Railroad Station, Niskayuna Reformed Church, and Rosendale Common School. The northern and eastern town lines are defined by the Mohawk River with Saratoga County, New York, on the opposite bank. The south town line is the town of Colonie in Albany County. Lock 7 of the Erie Canal is located in the town. The town is bordered by the city of Schenectady to the west. According to the United States Census Bureau, the town has a total area of 15.1 square miles (39.0 km2), of which 14.2 square miles (36.7 km2) is land and 0.89 square miles (2.3 km2), or 5.92%, is water. Niskayuna previously received the designation of Tree City USA, though it is not listed on the current Tree City USA roster. As of the census of 2010, there were 21,781 people, 7,285 single family homes,1,415 apartments, and a small number of town houses and condominiums. The population density was 1,438.3 people per square mile (555.3/km²). There were 8,046 housing units at an average density of 570.2 per square mile (220.2/km²). The town's population was 51.7% female and 48.3% male. The racial makeup of the town was 90.7% White, 6.0% Asian, 1.6% African-American, and 1.6% "Other." There were 7,787 households out of which 36.2%[reference needed] had children under the age of 18 living with them, 64.2% were married couples living together, 7.6% had a female householder with no husband present, and 25.6% were non-families. 22.1% of all households were made up of individuals and 11.5% had someone living alone who was 65 years of age or older. The average household size was 2.56 and the average family size was 3.02. In the town, the population was spread out with 26.1% under the age of 18, 4.2% from 18 to 24, 25.4% from 25 to 44, 27.1% from 45 to 64, and 17.1% who were 65 years of age or older. The median age was 42 years. For every 100 females, there were 93.3 males. For every 100 females age 18 and over, there were 87.8 males. Since 1980, "Niska-Day" is traditionally celebrated on the first Saturday after the third Friday in May. The festival begins in the early morning with a family foot race. This is followed by a parade and a fair. The day concludes with fireworks (weather permitting). Community groups pick a new theme each year (e.g., in 2007: "Niska-unity"). The town has the goal of bringing the families together for a celebration to help them recognize and appreciate their shared identity as residents of the town of Niskayuna. It takes place at Craig Elementary School Soccer Fields. The celebration was established in 1980 by the Niskayuna Community Action Program (N-CAP), responding to a school district report on mental health needs, to reinforce shared community identification. Unlike many municipalities, the town of Niskayuna does not sponsor an official observation of the Fourth of July. "Niska-Day" serves as the local substitute. Catherine's Woods Estates – A small neighborhood on the east side of the town near the Mohawk River. Edison Woods – A small, newer, upscale suburban development near the Knolls Atomic Power Laboratory. Forest Oaks – A small, upscale development off Pearse Road which borders Albany County. Hexam Gardens - a small development between Balltown Rd, Rt. 7, and the Reist Bird Sanctuary. Karen Crest – A small development in the southwestern part of town near Hillside School. Merlin Park - A residential area bordered by Route 7 (south), Rosendale Road (north), Mohawk Road (west) and WTRY Road (east). Niskayuna – A hamlet and census-designated place in the southeast part of the town. Orchard Park – A small neighborhood situated between GE Global Research and Niskayuna High School and bordered by Balltown Road on the west and River Road to the north. Stanford Heights – A hamlet in the southwest corner of the town that contains a historic mansion once owned by the parents of Leland Stanford and then later by their son Charles Stanford. Windsor Estates – Another small, upscale development near GE Global Research and the Knolls Atomic Power Laboratory (KAPL). The front entrance leads to Van Antwerp Road, Niskayuna High School, and Town Hall, while the back entrance leads to River Road. Woodcrest – A suburban neighborhood located off VanAntwerp Road connected west of Rosendale Estates. ^ "Profile of General Population and Housing Characteristics: 2010 Demographic Profile Data (DP-1): Niskayuna town, Schenectady County, New York". U.S. Census Bureau, American Factfinder. Archived from the original on September 11, 2013. Retrieved July 3, 2012. ^ George Rogers Howell and John H. Munsell (1886). "History of the Township of Niskayuna". History of the County of Schenectady, N.Y., from 1662 to 1886. New York City, NY: W.W. Munsell. ^ "Geographic Identifiers: 2010 Demographic Profile Data (G001): Niskayuna town, Schenectady County, New York". U.S. Census Bureau, American Factfinder. Archived from the original on September 11, 2013. Retrieved July 3, 2012. ^ "Tree City USA, NY Department of Environmental Conservation". ^ "Arbor Day Foundation listing of current "Tree City USA" winners". ^ "The History of Niska-Day". Retrieved May 21, 2009. ^ "Website for the Town of Niskayuna". Retrieved May 21, 2009. ^ "It's not the Fourth of July yet...it's Niska-Day!". Spotlight News. Retrieved May 21, 2009. Wikimedia Commons has media related to Niskayuna, New York.